"It is an honor to be at the forefront of retinal disease research." 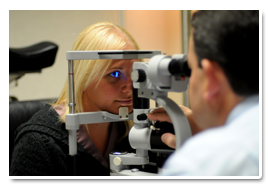 RCRI is utilizing technology that helps doctors identify early signs of eye problems that can otherwise lead to irreversible blindness. Through its research activities, RCRI provides information of value to other medical professionals in the form of original research and collective research. Outcomes analyses of differing surgical approaches unique to the Northern Palm Beach area will be culled for the first time as RCRI works to provide a template for reporting outcomes data not just from Retina Care Specialists, but also from other medical practices. In addition, RCRI also introduces premedical undergraduate or postgraduate students to retinal research in conjunction with schools and universities in the area, allowing young people an opportunity to help develop and present scientific theses at local and national meetings. Funding of RCRI has begun with a generous grant provided by a grateful patient which enabled resources for us to acquire a state of the art Optical Coherence Tomography machine (OCT). The Carl Zeiss Meditec Cirrus OCT machine allows exquisite three dimentional images of macular anatomy never seen before. This will help guide our understanding of a host of macular diseases while providing more detailed monitoring of patients with the dry form of macular degeneration. Other novel technologies are being used at RCRI to measure retinal autofluorescence to better explore and understand early signs of progression of dry age-related macular degeneration.